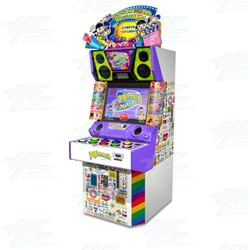 Pop'n Music 17: The Movie is a game in the Pop'n Music series of video games from Konami. This version includes lots of new songs and there is also a new song selection screen. Gameplay remains the same as in previous titles. The game features both popular licensed songs, and original Konami songs, features E-AMUSEMENT support, and can be played by up to 2 players. Gameplay is identical to other games in the series. The Pop'n Music controller features 9 buttons organised in two rows. After you select a song, the screen will show 9 coloured "pop notes" descending towards the timing bar. You must watch the screen, and hit the corresponding coloured buttons in time with the music and the notes on the screen. The game features both popular licensed songs, and original Konami songs, features E-AMUSEMENT support, and can be played by up to 2 players. Gameplay is identical to other games in the series. The Pop'n Music controller features 9 buttons organised in two rows. After you select a song, the screen will show 9 coloured "pop notes" descending towards the timing bar. You must watch the screen, and hit the corresponding coloured buttons in time with the music and the notes on the screen.